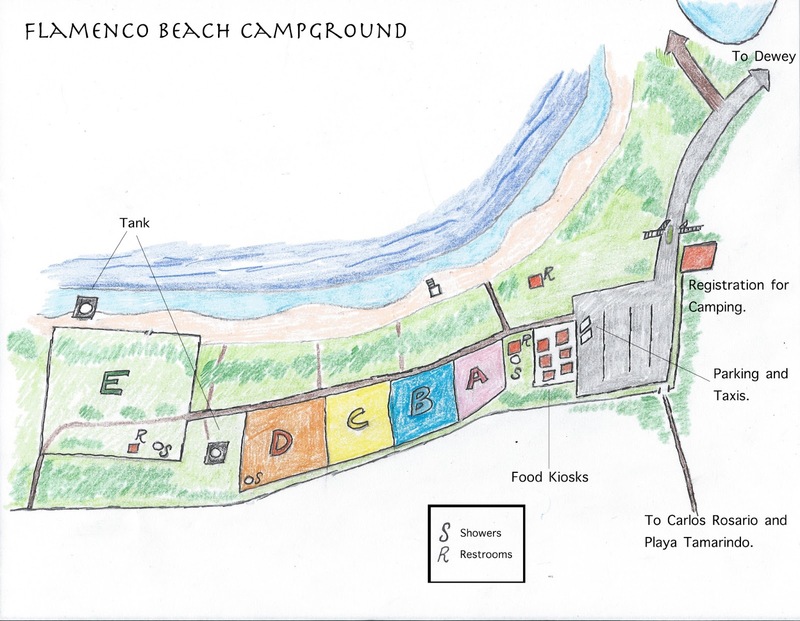 Above is a map for the campground at Flamenco Beach on Culebra. The campground is comprised of different areas or zones. These are A (pink), B (blue), C (yellow), D (orange) and E (green). Zone E is the largest and furthest zone from the kiosks and main beach area. Zone is also considered the "quiet zone" of Flamenco beach and is a popular area for those who have been camping on Flamenco for a very long time. Zone E is often the busiest of the zones, due to its picturesque area right along the ocean. Zones A through D are located more inland. Be prepared to spend a little while finding the perfect spot if you are coming on a busy day. 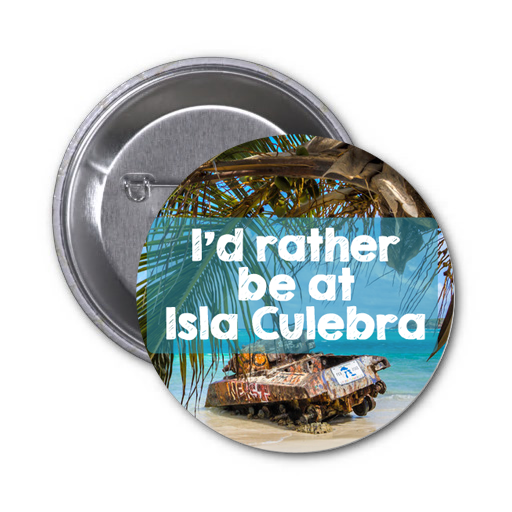 Generally weekends and times around holidays are the busiest times on the island. During the winter, midweek is a great time to find a spot for camping. When approaching Flamenco beach from the main town of Dewey, you will pass through a gate with a large parking area beyond it. The parking area is where one catches taxis that lead back to the ferry terminal or to other ferries around the island. The registration area is near the gate. This is where you pay to camp on Flamenco beach. A reservation is not necessary to camp on Flamenco beach. The cost to camp is $20 per night. You can pay for up to seven days at a time. You will be given wristbands and a receipt to hang from your tent once you register. Near the parking area are the food kiosks. These are generally open during daylight hours only and when the beach area is at its busiest. Some kiosks are only open during the mornings (especially during winter) and others are open only in the evening. While camping you will start to get a feel for the hours of the kiosks after a while. If you want to get back to Dewey, you can wait by the parking area for a taxi. The current fare is $3 into town one way. Some taxi drivers will offer you a reduced fare for round trip if you use their services to get back to Flamenco. This depends on the time of the year and how busy they are. There are various shower areas and restrooms on the island. The restroom near the beach by the food kiosks has a sink with potable water. The shower water is also potable, however the water in the various large water storage containers around the camping area is not recommended for drinking. Many people use the water here to clean clothing, wash dishes, etc. There is also a path that leads to both Carlos Rosario beach and Playa Tamarindo. These beaches are far less busy than Flamenco beach and offer much better snorkeling. Carlos Rosario is quite good for snorkeling, and if you did not bring gear, you can rent it at the food kiosks that are near the gate. While Flamenco beach gets praise for being one of the most beautiful beaches in the world, both Carlos Rosario and Tamarindo are gorgeous beaches. The sunset from Playa Tamarindo is especially nice to witness. The gate leading to Carlos Rosario and Tamarindo Beaches. While on Flamenco beach, be sure to visit the two decaying tanks which are located on each side of zone E. One tank is being reclaimed by the ocean. This tank is covered in rust and it is interesting to see during high tide as the waves overtake it. If you did not bring something, chances are you can easily acquire it. Tents, air mattresses, and other camping equipment is for rent at Tent City in the kiosk area. There are hammocks one can purchase as well. If you are visiting for the day, there are plenty of picnic tables around. Compared to the costs of lodging in other parts of Culebra, renting a tent and paying the $20 a day fee may still be far cheaper than finding a room in town or on other parts of the island. Waking with the sound of the ocean waves and the sun rising is an experience that should not be missed. If you want to spend a longer amount of time on Flamenco but don't have gear, you can purchase gear at Wal-Mart and other stores around Puerto Rico. A tent can be purchased for around $30 and a hammock for even less. Air mattresses can be found at a variety of stores in San Juan and around the main island for a small price. Publicos at the ferry terminal in Fajardo will take you to Wal-Mart if you want to purchase gear instead of renting it. If you are spending more than a couple nights on Flamenco beach or want to also go camping at Sun Bay in Vieques (which also does not require a reservation), buying a tent is a good idea. The camping area is quite safe. There are many guards and workers around that keep an eye on things. With that in mind, it is still very important to keep an eye on any valuables. Take anything valuable with you when you leave your site. When swimming, keep an eye on your possessions. Theft is uncommon, but does occur from time to time. What a beautiful campground! I have camped there a few times and it never disappoints. I can't wait to take my family this summer. Great post !! Nice and effective http://www.assignment-help-sydney.com/aussiessay-com-review/ blog post. The content is too short but effective. I love the information you share here. Its an well written blog post by you. This is awesome blog post. Hello very nice website!! Guy , .. Excellent Sportowe Buty Nike Free 5.0 Flyknit ..I will bookmark your site and take the feeds also?I am glad to search out a lot of useful info here in the post, we’d like work out more strategies on this regard, thank you for sharing,. good your blogs. I admire this article for the well-researched content and excellent wording. I got so involved in this 2017 Calzado Nike Tennis Classic CS www.calzadorunes.com/nike-tennis-classic-c-1_324.html that I couldn’t stop reading. I am impressed with your work and skill. Thank you so much.